Have you ever noticed how closely home decor trends follow fashion trends? As someone who prides herself on keeping up with the trends, I have to say that it's been really interesting to see the crossover between the industries. And especially when it comes to weddings. Right now vintage inspired details are really hot! And with that comes ornate detailing, gold leaf, beautiful embellishments and lovely lace. In addition, we're seeing a big focus on romantic silhouettes. The sort of silhouettes that have a way of sweeping you away to someplace romantic and ethereal. 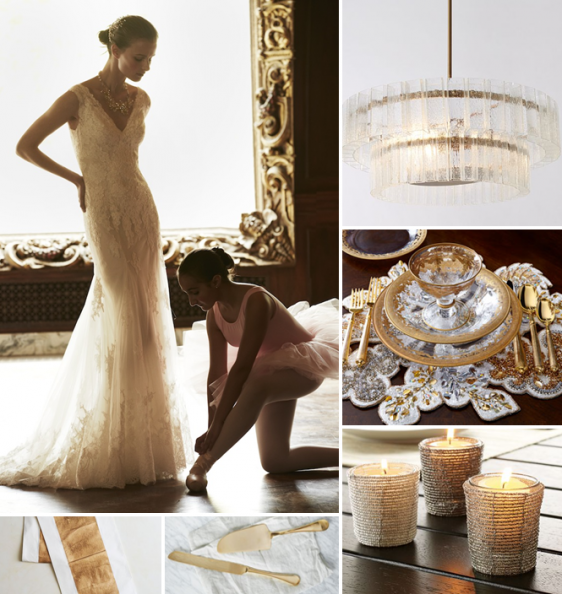 I'm loving how this gorgeous chandelier is mimicking this beautiful wedding gown by BHLDN. They look like they were made for one another. Am I right? But, you know, not every bride is going to want to jump on the 'vintage inspired' bandwagon. Maybe you're a bit more inclined to fall in love with a modern look like this one. I love this gown style and the lines and it's beautiful symmetry. And it's really neat how the same sort of angles can be seen in this capiz shell chandelier. One thing that I've always felt makes a wedding come to life is the lighting. And so I can't go without mentioning my love for candlelight. There really is something so timeless about the flickering of fire. And this gown? How romantic is this cascading tulle? Again, I'm really liking how the cascading affect can be seen here in this shell fixture. Wedding Gown: BHLDN // Capiz Shell Chandelier: West Elm // Chargers: Horchow // Calligraphy: // Candle Holders: West Elm And lastly, who isn't loving ruffles this season? And stacked ruffles? I can't say enough about my love for this trend! Such a beautiful effect this makes. And it's easy to see how this look is being translated into home trends. I'm telling you guys, this capiz chandelier is on my Christmas list this year and I've already picked out the perfect spot! You see, what I've realized here recently is that my decorating style really is a direct reflection of my fashion style. And so that's why I was absolutely thrilled when West Elm asked if I would share a few of my favorite pieces from their brand new Fall collection, inspired by all the hottest gown styles that have been hitting the runways this year. So tell me - Which trend is your favorite? 11 Comments " Trending Styles for Weddings "
I adore the vintage look! I've always loved old Hollywood and dreamed of a vintage inspired dress. Love that it's popular now. I love this post, two of my favorite things...fashion and home decor! What a clever way to think about wedding styles! I was actually just thinking about how much our home and the things I'm picking for our fête look alike! It's definitely interesting to see how the style similarities when it comes to home decor & weddings. I'm glad to know that I'm not the only one who thinks like this! Totally agree! Loving the shapes and charcoal greys of your "Modern Motifs"
Love this post! Such a great collection of styles with home decor and fashion. These are trends for a reason, each look is beautiful! An easy way, too, to add some glamor to an outdoor wedding. Wow.. Lovely Awesome Wedding Dresses.. Lovely Wedding planning Ideas.. Thanks.